For this style, use a large barrel curling iron. Wrap medium sections one by one around the barrel. Pull the curling iron up and outward to release a spiral curl. Then, finger comb wherever you want to make it looser. This is a great way to get some bouncy waves that look like overnight curls. Never underestimate the power of a setting spray when it comes to easy beach waves! Spray down straight hair with some product and then use a medium or small barrel curling iron to wrap hair sections away from the face. Loosen with fingers and spray again to finish. Wondering how to get wavy hair that lasts? Try a triple heating iron that provides a beautiful, natural-looking “kink” of curl for any hair texture. This also looks great on short hair – wavy is for everybody! While some wish to curl hair without heat, you can find a healthy compromise by using quite a bit less. If your hair is long, you may curl it mid-shaft to ends. Make a pony tail. Style ringlets with a medium-barrel curling iron. Brush through the ringlets to make them loose and natural-looking. Cut the elastic to release the curls. Curling your hair with a flat iron and then backcombing each curl at the ends with your fingers can add more body and bounce that would otherwise not come out naturally. If you are hoping for beach wavy hair without a ton of effort, follow this simple wavy hair tutorial. Curling irons can be expensive and temperamental – plus there are so many to choose from. Keep life simpler by curling your hair with a flat iron instead. You can get big wavy hair simply by wrapping a strand around the iron panels and curling as you normally would. The smaller the flat iron, the tighter the curl. The most popular curls right now come in the form of long, loose and beach blown waves. If you don’t live near the ocean or don’t naturally have beautiful wavy hair, you can use your straightener as a curler for double functionality. Twist sections of hair – as thick or thin as you want the curl to be – and then release after ironing top to bottom. Want to curl hair without a curling iron? You can learn how to get wavy hair simply by braiding it and then ironing the braids with your straightener. This works on all hair types, but holds best if you add some product before you start braiding. Long hair will shrink in length after you curl it with this method, but you’ll get some adorable small ringlets, so it’s worthwhile. Divide your hair into sections. Take a small strand and curl it around a pencil and then wrap your curl into a piece of foil. 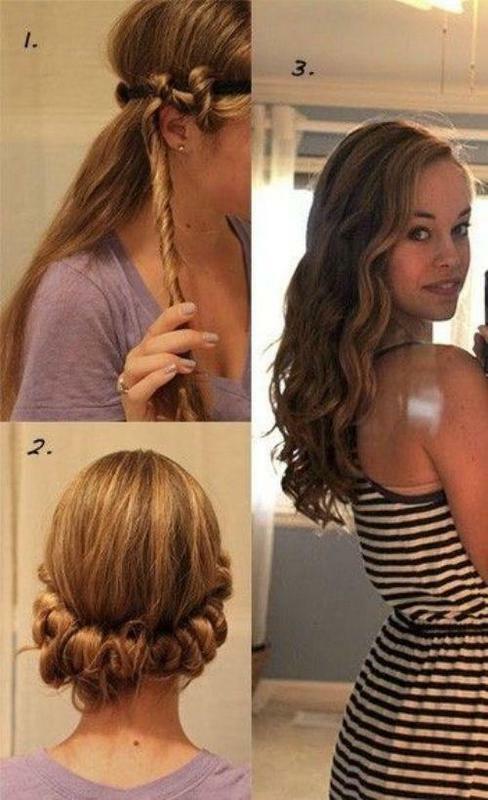 Use a flat iron to press the curl. Release the curl. Get curls that are laid back and pretty at the same time by braiding your hair ahead of time. After the braids have been in place for a bit, run your flat iron over them to set the pattern into your hair. When you unbraid, waves will be left behind. You can learn how to curl hair without using any sort of iron. Instead, section off clean, dry hair and wrap it around clips, foil strips or even some pencils. Spray with setting product, allow to dry and release a few hours later. This trick will work with thin hair as well as with thick locks. There are a few smart ways to curl your hair without heat. You can curl with a headband or use this creative twist-and-tie method. Use a styling product to enhance the hold. If you have a curl-worthy event coming up but don’t want to deal with rollers, braid your hair the day before. Use either regular or fishtail braids, sleep in with the chosen hairstyle and then unravel the braids in the morning for cute second-day waves. You can curl hair with a wand, or you can protect your tresses from heat damage by twisting them around a headband. Make loops completely around the band so it’s covered. You can use this trick for thick hair that is stubborn with an iron. Leave it in overnight and enjoy your natural beauty the next day! From blonde to black hair, curls are so gorgeous and easy to obtain. Roll your hair into spiraled bundles and use some bobby pins to secure the bundles flatly. Take the bobby pins out after your hair has dried. Instead of using a heat tool that can stress out your hair, keep things harmless with wavy hair products and the beauty of time. Place clean hair into a loose ponytail, divide it into sections and wrap each section around your 2 fingers 2-3 times, depending on your length, secure with a bobby pin and leave overnight. Take the pony apart in the morning and enjoy your curls! You can also purchase the bendy rollers your mom used. These are still around today because they work – so give them a shot. Twist a strand around a roller and then bend the ends together to fasten the curl in place. Leave in overnight or spray hair and blowdry before unrolling. Flexi-rods are curlers that look like bendable sticks. You can twist them any way you want. When learning how to curl your hair, you might want to try out different shapes and levels of tightness until you find what works the most beautifully for you. These waves are made on the centre parts of the locks, not touching the roots and the ends. Rub any water-based pomade into the roots to provide better definition for separate locks that you are going to curl. Use 1-inch barrel curling iron. If you have a similar length, you’ll need to wrap each lock around the barrel 3 times. Use a curling iron to curl vertically the front tresses framing the face towards it. Curl the following lock away from the face and continue doing alternating curling, holding the curling iron vertically and keeping in your mind that it doesn’t have to be perfect. Flip the bangs up at an angle. Wash your hair, dry it with a towel but do not comb. Apply a curl enhancer to your locks, not touching the roots. Blow dry your mane with a diffuser. Use a 1-inch curling iron to curl separate strands, wrapping them around the barrel, not clamping, for a looser curl. Gently brush through your curls with a wide-tooth comb. Use a headband and twist for a heat-free curling technique. You are going to get gorgeous loose waves without any risks of overprocessing or split ends. This method works for medium and long hair. And if you are also interested in short wavy hairstyles, please, check this page. Beach waves without a curling iron can be encouraged with an Epsom salt solution. Prepare a solution from ½ tablespoon of your regular hair conditioner, 1 tablespoon of dissolved lavender Epsom salt and ½ tablespoon of dissolved salt. Apply to damp hair and let it air dry. I know you are looking for an easy, quick and harmless method of creating cute waves. Try these and, I’m sure, you’ll find it. By the way, the Wavy Hairstyles Section offers tons of nice ideas on how to style your wavy hair.